Arizona law allows you to grant broad powers to an agent regarding your financial matters. A General Power of Attorney grants the agent the authority to do anything that the law allows the principal (the person granting the power) to do. This includes withdrawing money from the principal’s accounts, selling the principal’s property, and taking out loans using the principal’s name. This is why it is important not to grant this power without careful consideration of how trustworthy the agent is. You can also execute a limited power of attorney, in which you could authorize an agent to conduct only a specified task or limited number of tasks, like collecting payments from customers and depositing them. Thus, the financial power of attorney can relieve the principal from performing many mundane financial transactions and free time up to devote to more substantive matters. 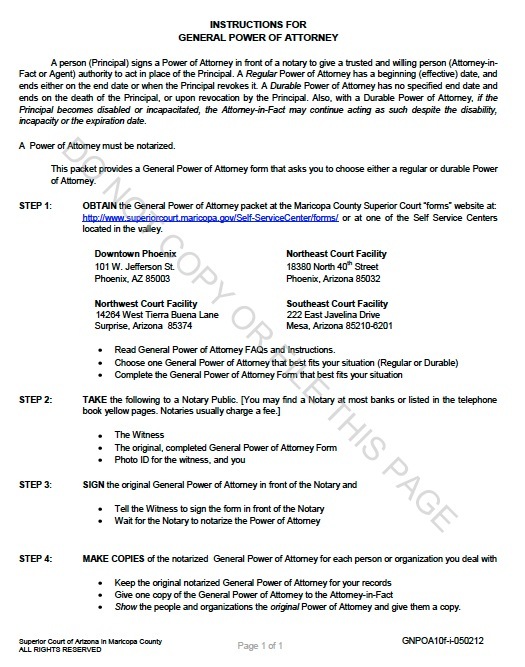 To execute a power of attorney, the principal must use a form to indicate which powers to grant to an agent, and then sign the document in the presence of a notary public and a witness. The witness cannot be the agent or the agent’s spouse.